One of the most dramatic differences after cleaning the exterior of a home is a clean driveway. Here at SMC Cleaning Services, we like to consider ourselves experts at driveway cleaning in Houston, Tx. This article is to teach you how to properly clean your driveway with a pressure washer. 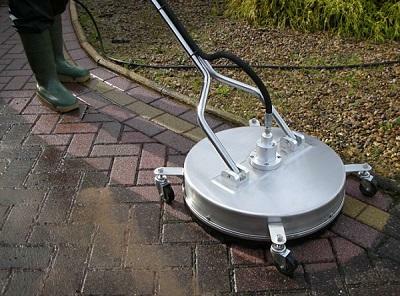 The first piece of equipment that is required when cleaning your driveway is a pressure washer. Any pressure washer will work when cleaning a driveway, but as a rule of thumb the more expensive the pressure washer the more powerful it is. This is essential for Driveway Cleaning in Houston, Tx because it will take you much longer to complete the job with a cheaper pressure washer. The next piece of equipment you need is a garden hose. This is to connect the water from your home to the pressure washer. Always make sure the water is turned on before you turn the pressure washer on, because running a pressure washer without water will damage the pump. Another piece of equipment that is required is high pressure hose. This is a specialty hose that connects the pressure washer to the wand. The wand is the device that you hold when cleaning a driveway that sprays water out of it. A recommended optional piece of a equipment is a surface cleaner. This is basically a device you walk behind that assists in driveway cleaning. A surface cleaner is pictured above. I am going to tell you how to clean a driveway with a surface cleaner. This is definitely the prefered method for cleaning driveways. First, make sure your driveway is clear of all objects. This includes cars, potted plants, basketball goals, and anything else that is easily moveable. Start by using the wand to pressure wash the entire perimeter of your driveway. You then use the surface cleaner by walking back and forth across the middle of the driveway. Check out our video section for a video on surface cleaners. The next step is to rinse all the dirty water off of your driveway. That is all it takes. It sounds simple, but it is actually a very dirty and daunting process. You can either give it a shot yourself or contact the pros at SMC Cleaning Services for a free quote on driveway cleaning in Houston, Tx. Call us at 281-899-0402 or fill out the form below for a free quote. Thank you and best of luck.